AeroStream Communications near Golden, Colorado entered the hobby radio market in 2013 with their revolutionary CommRadio CR-1 and follow up CR-1a SDR receivers. The success of these innovative radios left many asking for a transceiver of similar size and capability. The answer is the just announced CTX-10. 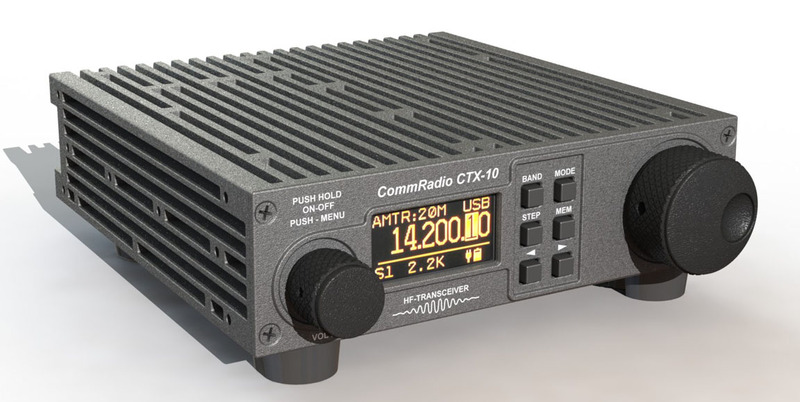 The CommRadio CTX-10 blends high performance, internal SDR technology, high efficiency circuit design, compact size and simple operation. This multi-mission QRP radio is ideal for field use and emergency operations. Transmitter covers 160-10 meter amateur bands with output power adjustable from 1 to 10 watts. The new design uses ruggedized land mobile power amps in push-pull. Every aspect of the radio design is optimized for low power consumption. The efficient and sharp OLED display is readable in low or high lighting conditions. The radio has three built-in #18650 3.7V 2600 mAh Li-ion batteries providing 28.8 watt-hours of operation. A built-in intelligent charger provides seamless power management. The general coverage receiver section uses multiple preselectors for optimized reception from 200 kHz to 30 MHz. An integrated CW reader and antenna tuner enhances portability. The premium tuning knob optical encoder is rated at a million revolutions. Entire enclosure is aluminum with metal knobs and front panel. External connections are through-hole mounted for durability. Includes USB cable, DC power cord and manual. DC power requirements: receive 1.5 W, transmit 20 W. This quality device is robustly built in Colorado, U.S.A.
I’m really looking forward to reviewing the CTX-10. If the CR-1 and CR-1a are indicators, this could be a very well-built unit with a top-notch receiver! Follow the tag CTX-10 for updates. This entry was posted in Announcements, Product Announcements and tagged CommRadio, CommRadio CTX-10, CTX-10, Universal Radio. Bookmark the permalink.